This page describes how meteorological information was captured and used by the British for field artillery purposes throughout the 20th Century. Meteorological conditions affect a shell in flight. If the meteor conditions vary from the standard ballistic conditions then corrections for these variations have to be applied, particularly if predicted fire is going to be used. Even if the fall of shot is adjusted onto the target the adjusting process may be reduced by applying corrections for meteor. Dealing with meteor conditions is an essential element of indirect fire. Before computers were used for ballistic calculations these corrections for non-standard meteorological conditions were called 'correction of the moment'. This correction was calculated by combining data about the actual meteor conditions and Range Table data to produce corrections to line and range. The alternative to using meteor data was a datum shoot, later called registration. Inaccurate meteor has two effects. First, it reduces the accuracy of fire, second, when many batteries are firing at the same target on different lines of fire then it increases the dispersion of the batteries' combined fire. For example wind might affect the fire of one battery as a crosswind but for another it may be a tail wind, if the meteor data is incorrect then the fire of these batteries will diverge. Generally, the size of the correction of the moment depends on the extent to which the meteor conditions vary from the standard condition and the duration of the time of flight. The extent of error in correction of the moment, and hence the effect on accuracy of fire, depends on the quality of the measurements or estimates of actual meteor conditions, the length of the time of flight and the methods used to convert the variation in meteor conditions into the correction of the moment incorporated in firing data. Unsurprisingly the accuracy of meteor data in the field improved throughout the 20th Century. Before World War 1 (WW1) the War Office did not have a meteorological service. The national Meteorological Office was a component of the Board of Trade. The understanding that meteorological conditions affected the flight of a shell because it affected air resistance developed in the latter half of the 19th Century. The fact that wind caused a projectile to deviate was identified rather earlier. However, the problem was measuring meteorological data at some distance above ground level. Kite balloons were used to take men aloft to measure air temperature and pressure, probably from the late 19th Century. However, measuring wind more that a few feet above ground level (or the top of church towers) was difficult, using a tethered manned kite-balloon, until 1909 when pilot balloons were invented. It appears that for compiling artillery Range Tables surface measurements and standard (but not entirely inaccurate) tables of the rate of change in temperature and pressure with altitude were used. The term ‘meteor’ arose in WW1 when it was the name given to the Meteorology Section of the Royal Engineers (RE) at GHQ in France. Two meteorologists, including Ernest Gold an eminent meteorologist, arrived at GHQ in mid-1915 to provide the BEF’s commanders with weather forecasts for their areas and became the Meteor Section after the Battle of Loos in September. To provide forecasts they, and their observers spread across the front, took local measurements and made meteorological observations at the standard global synoptic times of 0100, 0700, 1300 and 1800 GMT. Of course the Met Office couldn't provide all the men to do this so they had to be recruited and trained although the latter was quite quick due to their usually high standard of education (eg college science lecturers). In June 1915 the Royal Flying Corps (RFC) (Lt Col Brooke-Popham) offered to provide daily wind speed data at 10 am to assist in the calibration of guns. The chief meteor officer at GHQ was also studying the matter. This offer was declined, probably because at that time there was no convenient means of using the data. However, the subsequent range tables were based on firings in March and April 1915 so it seems likely that a decision had been made in early 1915 and the Royal Artillery and the Ordnance Board had the matter in hand. For current meteor data to be usable there had to be ‘basic data’ that enabled the current meteor data to be converted into corrections to range and line that could be applied to the guns’ firing data. This ‘basic data’, which was different for every gun and propelling charge, and varied with the range it was firing at, started to appear in artillery Range Tables and their Addenda or 'correction cards' from late 1915. Nevertheless, in January 1916 the BEF’s GHQ issued Artillery Notes No 1 – Close Shooting in the Field and in April issued an appendix to it called Some Notes on Meteorological Conditions which Affect Gunnery. This explained how to measure barometer and temperature and explained that surface wind was not a reliable guide to the wind that affected a shell in flight. On 12 April 1916 regular meteor telegrams started being issued to the British artillery in France, they rapidly evolved. This section traces the evolution of the meteor data produced for and distributed to British field artillery. This data reported the measured meteorological conditions that affected artillery fire. It was not a forecast and did not tell the artillery the size of the corrections they had to make to their firing data. Meteor data was used by batteries to calculate the correction for their particular guns firing a particular distance in a particular direction. The first meteor (met) telegrams were very simple. All they gave was wind speed (in feet/second) and direction (in degrees from true North) at 2,000 and 4,000 feet above sea level (or 3,000 feet if it was foggy). In August 1916 air temperature (in degrees Fahrenheit) was added. It appears that batteries were expected to find their own local barometric pressure (in inches of Mercury). It's not entirely clear where these telegrams were produced. It may have been in GHQ for the entire BEF or it may have been done somewhere by the RFC. However, by late 1917 a few surveyors from the sound ranging sections joined meteorologists at each Army HQ to produce special meteor telegrams for sound ranging. However, on 2 March 1917 the content of met telegrams expanded. The data was now based on artillery projectile times of flight – 7, 10, 20, 30, 40 and 50 seconds with air temperature, wind direction and speed for each. Surface data was not representative of the atmosphere above. For shooting the air temperatures needed were the mean differences (properly weighted) of the temperatures from the standard temperature for all heights. The standard temperatures were 60°F at the surface decreasing by 10°F per 3,000 feet (somewhat different to the figure in the pre-war Text Book of Ballistics). Always use the most recent telegram’s data. Instructions, using a simple table, on how to adjust the local barometer reading to the one applicable to the time of flight according to the air temperature given in the meteor report. In January 1918 further changes occurred, 60 second time of flight data was added, and in March barometric pressure (thus removing the need for batteries to measure it locally). Barometric pressure was that for mean sea level (MSL), which batteries then had to adjust to their own height using the standard constant for loss of pressure with height. In mid-1918 the wind data started being weighted and was called ‘equivalent constant wind’. The format of these messages was to set the pattern for the future, they started with information about the currency of the message, then provided temperature and wind data for each time of flight, starting with the longest time. Air density, which is the actual determinant of air resistance to a shell in flight, was more difficult to measure, particularly at more than a few feet above ground level. The British approach was to use barometric pressure, humidity and air temperature as proxies. An increase in pressure increases air density but an increase in temperature or in humidity reduces it. Humidity was incorporated in the air temperature data, which was then called ‘virtual temperature’, so only barometric pressure and virtual temperature were distributed to batteries. Of course these were measured a few feet above ground level, so they had to be adjusted to represent conditions at trajectory heights. There are two ways of doing this, either by extrapolating the ground measured data or getting measuring instruments aloft and retrieving the data from them. In both world wars the first was the usual method for meteor reports to artillery. In essence the meteorologists on the ground had to estimate the conditions in the body of air above them to deduce data. This meant estimating the differences from the standard atmospheric ‘profile’ - temperature drops at a constant rate with altitude. However, particular atmospheric conditions could make higher air warmer than lower. These estimates of difference were made by local observation of cloud and weather conditions and sometimes, when it was available to these forward meteor observers, by reference to synoptic data. Meteor data had to be weighted for field artillery use. This is because a shell spends more time in the top part of its trajectory than in the lower parts, 50% of flight time is spent in the top 25% of a trajectory’s height. It meant that the wind data for a particular time of flight, eg 40 seconds, made allowance for the wind data at lesser times of flight but more ‘weight’ was given to the raw 40 second data than to the 20 second. In other words the data for each time of flight was not the raw data for the trajectory height implied by that time. It was actually the weighted mean of the raw data at all the ‘levels’ up to and including the specified one. The weightings reflected the amount of time that a shell spent in each level. British meteor reports started using weighted wind data, subsequently called ‘equivalent constant wind’, in 1918. The weighted equivalent constant wind was roughly the actual wind at three quarters of the maximum height of the trajectory (not 2/3 as the pre-WW1 Text Book of Ballistics had stated). In 1917 an extended trial using a circular sound ranging base, with regular explosions at its centre and measurement of the atmospheric conditions, provided data to improve the accuracy of sound ranging by correcting for atmospheric conditions. By the mid 1920's weighted data was used for virtual air temperature, and called ‘ballistic air temperature’. It added the weighting for the time of flight to the virtual temperature that already reflected humidity difference from the standard atmosphere of 50%. Weighting was applied during production of a meteor report using tabulated data covering altitude range 1,000 to 35,000 feet. The weights applied to wind and temperature for times of flight remained unchanged from the 1920's until adoption of the NATO STANAG 4061 for Standard Ballistic Met Message in 1957. Soon after WW1 the shortest time of flight, 7 seconds, was replaced by 5 seconds and the order of data in meteor reports changed to ascending order of time of flight instead of descending. Additional types of report were also introduced, that for AA artillery did not weight the data, and was provided for a height of 12,000 ft.
Special meteor reports were also provided for calibration firings. These used weighting factors that were specific to the type of gun, projectile, MV and elevation angle, with data sampled for 5 or 10 layers equally dividing the trajectory height. Pilot balloon ascents were made throughout the calibration firing period to record the actual conditions during calibration, including wind data relative to the actual azimuth of fire. Whenever possible a kite balloon or aircraft were used to sample temperature and humidity. In addition to ballistic temperature the elasticity temperature and tenuity factor were also calculated and provided. These gave measures of density. By WW2 the meteor report for field artillery was called a Surface Target (ST) Meteor Report, although meteorologists usually referred to it as ‘flat fire’, in contrast to the ‘sloping fire’ of the AA Meteor Report. The latter had changed to give data in 4000 ft layers up to 40,000 ft, and included data weighted for an ascending trajectory only. Calibration meteor was calculated using sampling layers that were each 10% of trajectory height. No attempt was made to measure pressure and humidity above ground level and elasticity temperature was no longer included. However, data was collected as close a possible to the trajectory. Calculations to produce meteor reports continued to use tables and graphs. The arrival of the US in the war introduced a need to be able to use the US ‘metro message’ by converting it into a British ‘meteor telegram’. US firing tables were also initially used for some US origin guns and these provided met corrections based on a US metro message. This meant that British batteries had to convert UK met data to US type met data. Main difference was that the metro message used Lines for meteorological layers instead of Time of Flight. Others were mils instead of degrees for wind direction, mph instead of ft per sec for wind speed, and air density instead of barometric pressure and air temperature. Conversion methods from US Metro to UK Meteor, and vice versa, was published in Royal Artillery Training Memorandum (RATM) No 11 (April 1944). It provided a graph to convert US temperature and density into UK ballistic temperature and barometric pressure. RAF meteorologists in sound ranging batteries provided data to correct sound ranging results for meteorological conditions up to several hundred feet above ground level. changes to the units of measurement, including MDP height in Decametres, wind speed in whole Knots instead of ft/sec and wind direction in hundreds of Mils instead of Degrees. Wind speed and direction, air density and temperature were all weighted for their met line, hence called 'ballistic’, and the temperature continued to be adjusted for relative humidity. Figure 1 compares the met lines and the previous UK times of flight. An important point is that for data capture UK had used sub-layers within the time of flight layers to provide the weighted mean for a layer whereas the NATO system used just the zone between lines. In the UK system sub-layers had been 500 ft up to 20 secs, then 2,000 ft to 60 secs, then 4,000 ft. Figure 1 also shows the indicative gun range for a met line or time of flight. For the UK the NATO message meant that range tables had to be reworked and new Correction of the Moment Graph sets produced. It seems that STANAG 4061 meant that all NATO member nations had to make changes of some sort to their national methods. STANAG 4061 Standard Ballistic Met Message also specified a message for AA fire but made the special calibration met report unnecessary. However, there was a target acquisition met message and a met request message was also introduced. 26 narrower Met Zones up to 20,000 metres (Zone 00 gave surface data, Zones 01 to 05 were unchanged, then 500 metres wide to 5,000 metres, then 1,000 metres wide). Wind direction to 10 mils. Virtual air temperature to 0.1°Kelvin (Virtual meant it still included allowance for relative humidity). The data was neither weighted nor expressed as a percentage of the standard atmosphere. The computer calculations ‘flew’ a shell’s trajectory using the actual meteor data for each zone it passed through. Since the frequency of these calculations depended on the integration step length, a short length of the trajectory, the number of calculations with data for a particular met layer depended on the amount of time the shell spent in the layer. Also agreed in the 1960's was STANAG 4140 Target Acquisition Met Message. This provided wind and temperature data and cloudbase height. It replaced earlier national messages. The latest step is STANAG 6022 of 2005, which provides for gridded meteorological data. This means that instead of representing a single balloon ascent and local data it provides a grid of data in four dimensions – vertical, two horizontal and time that may be compiled from many data sources including improved forecasting. The basic area of coverage is 60 km × 60 km, divided into cubes. A particular benefit of this approach is that it provides data that is more representative of the trajectory and different data can be used can be used along the trajectory. However, the data is only available as a data file and this means that it can only be distributed through data communications with a means of transferring it to a fire control computer using the NATO Armaments Ballistic Kernel (NABK). It can also be used with gun locating radars to improve the accuracy of their results. This four dimensional meteor grid using data from many sources removes the need for local data acquisition. Since meteor conditions continuously change and the accuracy of artillery fire depends on the meteor data then data needs to be updated fairly frequently. The first met telegrams, from 12 April 1916, were only issued twice daily at 9 am and 3 pm. In January 1917 frequency increased to three daily messages at 5:30 – 6 am, 10 – 11 am and 3:30 – 5 pm. A few weeks later on 2 March 1917 the number of met telegrams (also called meteorological reports) increased to 6 times per day varying in duration between 3 and 5 hours. In January 1918 a 7th daily message timed to help dawn barrages, also started being issued. Radio was recognised as the most desirable means of distributing met telegrams to batteries and it was proposed in 1916 by making use of the RFC wireless service. However, this was considered to be another complication for batteries and was not adopted, in 1917 it was considered a viable change but by then the RFC service had no spare capacity. After the war the only messages were those provided at firing camps and the School of Artillery, perhaps twice for a day’s shooting. In WW2 frequency varied. At the beginning of the war it was supposed to be 0600, 1200 and 1800. However, it is unclear if this was achieved in France in 1940. Subsequently, from about 1942, messages were supposed to be every 4 hours. At El Alamein in late 1942 new met messages were being distributed as frequently as every 30 minutes and hourly messages were the norm. However, in Normandy in 1944 messages were being issued only every 6 hours and the MGRA of 21 Army Group had to intervene with the RAF (who provided the data), the frequency increased to every 2 hours. With STANAG 4061 introduced in 1957 the standard frequency of messages was 4 hourly. However, subsequently more frequent messages were provided if necessary. If meteor conditions are stable then less frequent messages may be satisfactory. In unstable conditions up to 16 messages per day may be needed. The key element in meteorological data is the standard atmosphere. The artillery starting point for this was the pre-WW1 standard conditions (air temperature 60°F, air pressure 30 inches of Mercury, no wind) for which range tables were compiled. By the mid 1920's meteorological standard conditions were defined as still air, pressure at the ground 30 inches of Mercury at 32°F at 45° latitude, relative humidity 50% and density defined as log(ρ0/ρ) = 0.141h/10,000 where ρ0 is density at ground and ρ the density at height h, in feet. In 1941 the War Office introduced its Standard Ballistic Atmosphere. The changes from the previously used standard conditions included recognition of the stratosphere above the troposphere from the tropopause at 35,000 feet, ‘sea level’ instead of ‘ground’ pressure of 30 inches of Mercury, relative humidity of 50% being worth 0.261 inches of Mercury at sea level at 60°F, air density at sea level of 534.2 grains per cubic foot, and the standard velocity of sound as 1,120 feet per second in 50% relative humidity at 60°F. This standard atmosphere also provided a more accurate model of how the atmospheric variables changed with altitude. Pressure 1013.25 millibar (760mm (29.92 inch) of Mercury). These parameters change above sea level, and the standard atmosphere includes standard data at different altitudes. Charge temperature was not affected and remained 60°F. The ICAO standard atmosphere is also used in NATO messages. However, in the late 1960's a NATO STANAG for Firing Tables changed the standard charge temperature to 21°C (70°F). Wind direction was always relative to True North, not magnetic or grid north. To be most applicable data needs to be captured from the vicinity of the artillery trajectories. For a single message and trajectory when manual calculations are being used the ideal is for the data to accurately represent the conditions in the top 25% of the trajectory. Local conditions can give distinct changes. For example in WW1 the coastal offensive in 1917 was forced to use met data from further South in Flanders that was not representative of the coastal conditions. The result was the predicted barrage being some 200 yards out of place. In WW1 lower level wind data was measured by ‘Pilot Balloon Ascents’ (PBA) (launched by RE NCOs at divisional HQs in WW1). The method was to fill a balloon with hydrogen to a weight that meant it would ascend at a rate of 500 feet per minute, and then using a meteorological theodolite, oriented relative to north, to measure the bearing and elevation angle to the balloon every 2 minutes. A meteorological theodolite had a right angle telescope to enable upwards observation. Ideally two theodolites were used so that a balloon dropping if it hit an air pocket could be measured but this was a luxury reserved for meteorologists in the rear areas. Given these readings and the standard rate of ascent then the wind speed and direction could be quickly calculated – in the time between readings. Of course the tracking instrument on the ground has to be oriented in order to be able to calculate the wind direction relative to North. The use of PBA was quite new in WW1, it had been first used by meteorologists only in 1909. Of course the single balloon method ignored effects such as vertical air currents and was only possible before the balloon was obscured by cloud. Observations could be made at night by hanging a lantern below the balloon. Balloons were limited by the cloudbase where they disappeared. Getting instruments aloft and their data to ground was a challenge. In WW1 there was some use of kite balloons (used by the balloon companies of the RFC for observation all along the W Front) to carry meteorologists aloft to measure temperature and pressure at pre-determined heights. Aircraft were also used, in 1918 there was a meteorological flight based near Calais and probably another further South. Their task was to measure higher altitude, up to 14,000 feet, conditions that was needed for the long range guns such as the 14-inch railway guns. However, there was a related method. Every 4 hours the Met Section at GHQ used isobaric charts and upper air measurements to prepare a wind forecast for about 4 hours ahead. These forecasts were sent to the meteor staff at each army HQ where they were combined with data from pilot balloon ascents to produce the actual meteor telegram. When upper air measurements were impossible the isobaric charts were used to deduce 'gradient winds' and modified to allow for the temperature distribution. In addition, from 1916 the Germans started distributing upper air messages by wireless from Bruges and these provided another source of data. In the late 1930's radio direction finding techniques were developed for balloon tracking with a simple transmitter hung from the balloon. Most of this work was at the Met Office station at the School of Artillery, Larkhill where the first successful ascent was made in 1939. In 1941 it started being used in other places but does not seem to have been used overseas. Also by the late 1930's radio sondes were becoming available, although UK meteorological service was a slow adopter and the national sonde had poor performance, they were not generally used for artillery met messages. Sondes were carried aloft by balloon and transmitted data back to the ground, with the balloon itself visually tracked using a met theodolite. In 1940 UK adopted sondes produced in France and Finland, sources that became ‘difficult’ a few months later. The poorly performing national sonde had to be adopted while a better one was developed. However, sondes were only used by selected British forecasting units in WW2 and their data probably only rarely became part of artillery meteor reports in the field. Of course sondes required a much larger balloon to carry them aloft at the required rate of 500 ft/sec and this meant that more hydrogen was needed. In mid war it was found that Radar AA No 3 Mk 2 could be used for balloon tracking instead of a meteorological theodolite, the balloons carried a simple lightweight radar reflector. 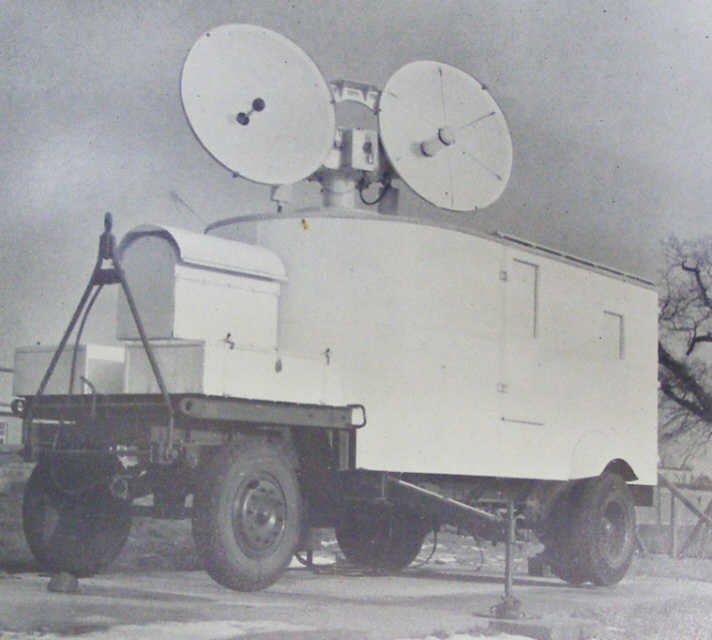 This radar was designed for HAA fire control and operated at around 10 cm wavelength (about 3 GHz). It entered HAA service in early 1942 but was not widely available until well into 1943. Radar tracking of met balloons was particularly useful for higher altitudes and cloudy conditions. Tracking with these RA radars was used in NW Europe and Burma. They were also used to track ascents carrying sondes. Met messages could be compiled solely from local data – pilot balloons, data measurement at ground level and observations of local conditions to estimate the characteristics of the vertical air mass. However, forecasting elements had access to higher level data that was valid over a wide area and there were also synoptic messages. All this could be integrated into the data for artillery met messages. In WW2 such data was broadcast using encrypted transmissions but it’s unlikely that these regularly got below army or corps HQs. In 1940 they were provided by the Met Office in London and their French equivalent in Paris. Furthermore forecasting detachments at corps HQs could provide sufficient data to enable forward meteor detachments to use tables to produce data for meteor reports when they could not make PBAs. This was used throughout the war. In both world wars data collection used specially instrumented aircraft. In WW2 the RAF formed meteorology flights flying Gloster Gladiator biplanes to sample conditions up to 24,000 feet. In N Africa a technique was also developed to derive high level wind data by observing HAA shell bursts. After WW2 radar tracked radio sondes became the normal means of collecting data for artillery meteor purposes, initially these sondes only provided air temperature. A later model WW2 AA radar was introduced for tracking, Radar AA No 3 Mk 7, which had autotrack. This locked onto a reflector under the balloon and automatically followed it. 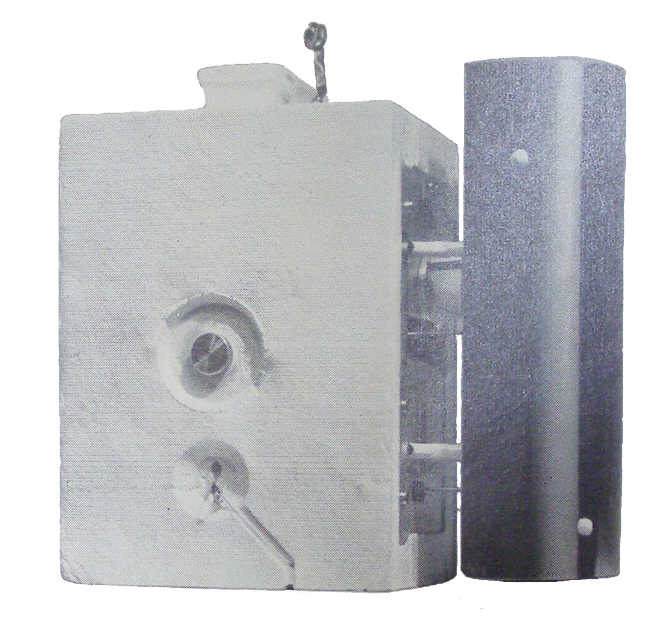 Ground equipment included the Baromec, an aneroid barometer that measured pressure with great precision, and battery powered pyschrometers to supplement the hand whirled model (like a traditional football rattle). Psychrometers measure the amount of water vapour in air, ie humidity. Ground based anemometers measured surface wind and thermometers, of course, measured surface air temperature. 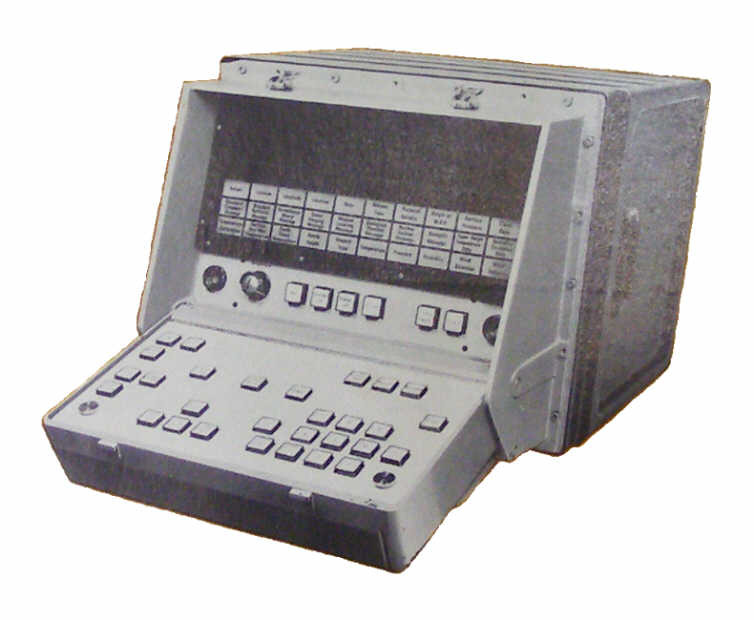 In 1960 a new sonde was selected, there was a choice of three possibilities but the German produced radio Grausonde, the M60, was adopted, not least because it was already used by the Royal Navy. This measured air temperature, pressure and humidity using simple devices giving an electrical output. The Grau morse encoder converted these measurements to morse code. This was radioed at slow speed to the ground station, where it was manually transcribed, on the standard meteor data frequencies between 27.5 and 28 MHz (which was just within the band of the standard artillery Larkspur VHF radios). This sonde weighed 0.685 kg and was powered by a 4.5 v battery. At the same time a new device was introduced for calculating meteor messages from the data, this was the Meteor Slide Rule No 4A. The use of an AA radar to track a sonde carrying balloon continued until the 1970's when AMETS (artillery meteorological system) entered service for some 25 years. AMETS included a new balloon tracking radar, FA No 19 Mk 1 (Plessey WF3M), to replace AA No 3 Mk 7(F). The radar included an antenna to receive the M60 radio sonde transmissions. One of the vehicles conditioned the sondes, a process taking about 30 minutes before their flight. The Command Post vehicle carried the AMETS computer and communications. Computation used the same computer as FACE albeit with a smaller console and a different keyboard and reduced user interface matrix for the meteorology program. The equipment used to measure surface data was unchanged. However, ‘light weight’ met troops continued to use optical balloon tracking and manual calculations with tables, graphs and the Meteor Slide Rule. In the 1991 Gulf War AMETS was supplemented by a Vaisala radiotheodolite system on trial. In the 1990's radar tracking was replaced, as part of BMETS, by a much smaller radio theodolite, a passive device that tracks sondes by radio location of their data transmissions of air temperature, pressure and humidity. BMETS uses the Vaisala RT20 radiotheodolite system that uses a cluster of four antennas to determine the bearing and elevation to the sonde, one antenna receives the data transmitted by the sonde. The 1680 MHz signals from the sonde are amplified and converted to 400 - 406 MHz then passed to the radio receiver and through to a rugged laptop computer to process the data and produce met messages. Light regiments used the basic Vaisala equipment. Various types of sondes can be used, generally the sensors use capacitors to produce an electrical signal. Advances in electronics enabled lighter sondes, only 0.3 kg, and hence smaller balloons needing less hydrogen to lift them. The various hand-held instruments used to measure surface data are replaced by an integrated Surface Data Instrument that captures temperature, pressure, humidity, and wind speed and direction, and can be elevated on a hydraulic mast. Its data is presented on a Surface Display Portable Unit and from there fed into the laptop to calculate dewpoint and be processed into a met message. A persistent problem for using pilot balloons in the field is providing gas for the balloons. While helium is attractive because it is inert, in practice hydrogen has always been used. Either delivered from base depots in high pressure cylinders or generated at the point of use. In WW1 hydrogen had to be supplied for various balloons so central supply was sensible, but by WW2 there were no balloons apart from met in the forward areas. 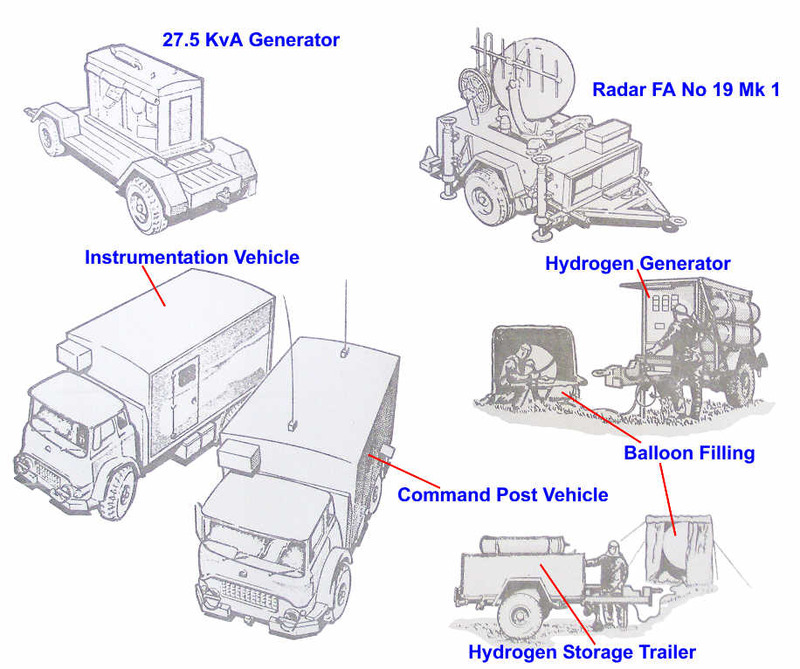 However, in 1941 hydrogen generators were issued. These were steel drums about 18 inches high with a lid and a hose through which the hydrogen was ‘tapped’. The mixture in the drum was caustic soda and water with ferro-sillicate as a catalyst and a single mix produced sufficient hydrogen for the largest balloon. The following year a smaller generator using calcium hydride was introduced. After WW2 delivered cylinders were used until a few years after AMETS entered service. This used a trailer mounted hydrogen generator and another trailer with storage tanks, see Figure 5 above. The hydrogen generator was electrically powered with methanol and de-mineralised water as the source of hydrogen. Introduction of the replacement BMETS saw a reversion to gas provided in cylinders through the normal military logistic system. The detachment carries sufficient gas for at least 3 days. By early 1916 meteor observers, usually 2 NCOs, were deployed to the HQs of each army, corps and forward division to observe and report meteorological conditions. It appears that there were also meteorologists with the RFC. Additional single observers were spread along the front to monitor surface wind direction and speed and report when conditions were suitable for the enemy’s use of gas. Meteorologists in Army HQs were responsible for producing meteor telegrams for their Army area. However, at the end of 1917 when sound ranging telegrams for sound ranging were introduced, they did not have the resources to produce them. They were reinforced by soldiers detached from the sound ranging sections. The RE meteorology responsibilities were taken over by the new RAF and Air Ministry in 1919. They used civilian meteorologists who were part of the new Meteorological Office, which had an Army Services Division. There were no uniformed meteorologists. The Met Office provided meteorological support to the army including permanent forecasting and observing units at War Office training and experimental establishments; seasonal observing at artillery practice camps in summer months; artillery meteor reports to coast artillery at defended ports at home and abroad; and AA meteor reports to Inner and Outer Arty Zones of Air Defence of Great Britain and local air defences in UK. In addition, between wars activity included considerable work on developing the meteorological methods needed for the use of gas (ie chemical weapons) and alternative ways of collecting upper air data. The gas related work was used in WW2 for planning large smoke screens produced by ground canisters operated by RE. Upper air methods included aircraft, using a meteorology flight based at Duxford, and acoustic methods with shell bursts in clouds. In 1921 the War Office agreed with the Air Ministry that for a small war RAF meteorology elements would be provided to the field army. The ‘ten year rule’ (no planning for a major war within the next 10 years) meant that large war requirements were not addressed. The intention was that some 150 Met Office staff would volunteer to be RAF reservists to provide met support in the field to both the Army and the RAF. In fact there were never anywhere near the required numbers and the matter was dormant until 1936. In that year planning started for an Army/RAF Expeditionary Force in which the Army element was two corps. Met Office volunteers would still man the field units, there were still no regular Army or RAF meteorologists. The main elements for the Army were sections for GHQ and corps HQs, detachments for each sound ranging battery, pilot balloon sections and ‘Wind & Weather’ observation posts. Initially these were limited to army level units and detachments with artillery survey regiments and HAA batteries. In 1940 the met elements (Met Office staff mobilised into the RAF) with the BEF were in GHQ, corps HQs, survey regiments and some HAA batteries. Subsequently detachments went to divisions as well as survey regiments. The divisional detachments were not a success due to their lack of communications, including inability to monitor the met broadcasts. By mid 1941 corps HQ sections were expanded but divisional ones were abolished in UK. However, in late 1943 the basic scale became a mobile forecasting unit for each corps HQ and 3 man detachments, mobile pilot balloon units, to each divisional artillery, AGRA and sound ranging troop. These produced meteor reports using their own balloon ascent data, ground level measurements, observation and interpretation of local meteorological conditions, and tabulated data for the higher atmosphere. They could also receive broadcasts of upper air temperatures. In many cases these detachments were attached to artillery regiments for administrative convenience and so that their data was sourced closer to the guns’ trajectories. In N Africa there was a steady expansion from late 1940 and there was a RAF met detachment in Tobruk throughout the siege in 1941. Furthermore the dispatch of the only survey regiment’s sound ranging battery to E Africa with its RAF meteorologists led that regiment to train some of its soldiers as meteorologists. RAF met units also accompanied the forces sent to Greece and Syria. From mid 1941 these were formally numbered and named Mobile Met Units (MMU) and in mid 1942 they became units in their own right and not part of another one, this simplified their administration. By the end of the N African campaign there were RAF MMUs with each corps and AGRA and with some divisions. This pattern continued into the Italian campaign. There do not seem to have been any met units assigned to the army in Malaya. It is unclear if those at RAF bases managed to produce and distribute artillery met messages. It took some time for the RAF to produce the number of meteorology detachments required by the British and Indian armies in India and Burma. In mid 1943 the RAF established a 3 month training course in the Middle East for airmen from the Mediterranean and Indian theatres. As an interim measure the Royal Artillery found it necessary to form and train their own divisional PBA detachments in India. Eventually RAF or IAF met detachments were available for each divisional and corps artillery in Burma, normally attached to an artillery regiment. In 21 Army Group in NW Europe there were RAF met sections with survey regiments, each HQRA at division and corps and with each AGRA. The RAAF operated in a similar way for the Australian Army. The Canadian artillery provided their own meteorologists who were trained by the RAF in UK. The New Zealand survey battery in the Middle East trained its own meteorologists. The Air Ministry retained responsibility for providing meteorology support to the army after WW2. However, during the 1950s it became increasingly clear that the Royal Artillery should take responsibility in order to be sure of a reliable service in the event of war in Europe. The change formally occurred in 1958, training had started the previous year when Air Ministry meteorologists in Germany started training soldiers in 94 Locating Regiment. Courses at the School of Artillery started in 1959. Meteor Troops were formed in locating units to do this, basically on a scale of one per division or independent brigade. 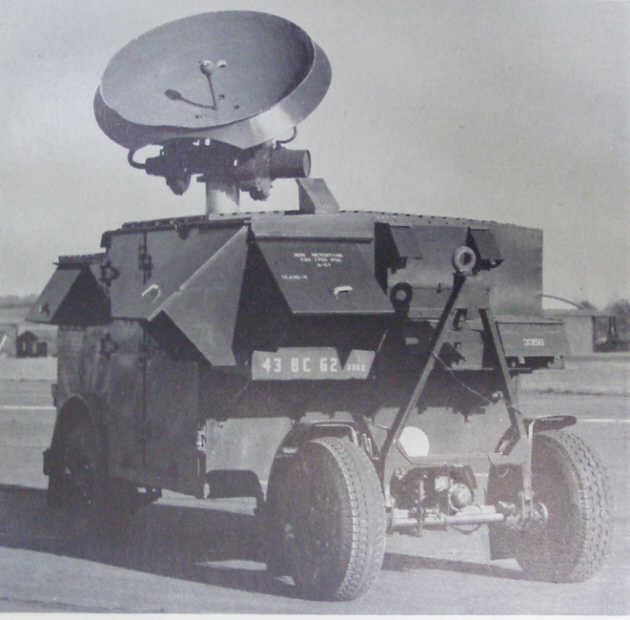 They used Radar AA No 3 Mk 7(F), which was already in use in the regiment for mortar locating) until it was replaced by AMETS in the early 1970's or light weight sections without radar and electronic computer. These troops were substantially larger than the WW2 divisional detachments, around 15 men for AMETS. However, despite the transfer of met from RAF to RA, it appears that no met was provided for artillery during the 1960's campaigns in Aden and Borneo although a section was stationed Malaya. In Borneo ‘standard conditions were used, with a standard correction to range to reflect the higher ambient temperature. Also during the 1960's pilot balloon ascents without sondes were re-introduced. They were the alternative method of measuring the low level wind speed and direction at the launcher position of each Honest John free flight rocket. The balloon ascents were conducted by the firing section itself a few minutes before firing. The primary method was a mast mounted anemometer. The introduction of BMETS in the 1990's led to a further change, the greatly simplified equipment led to a section of some 5 men with each regiment with a dramatic decrease in the size and number of vehicles required. The introduction of gridded meteor data and data communications for its distribution removed the need for BMETS and Vaisala detachments, with data provision once again becoming the responsibility of the Met Office, now privatised, and an RAF expeditionary element, a MMU, relying on reservists in the Met Office, just like the 1920's plan. Copyright © 2006 - 2014 Nigel F Evans. All Rights Reserved.